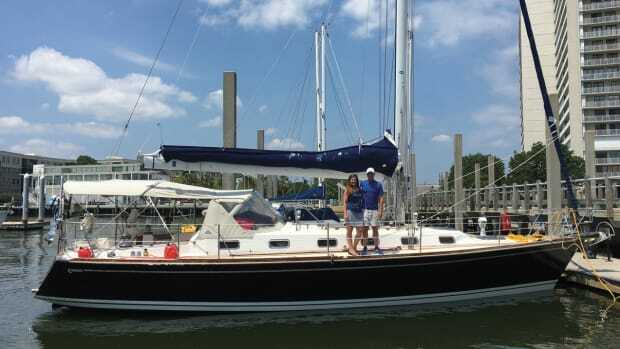 While test-sailing the new Moorings 5800 (sold to private buyers as the Leopard 58), the opening line from Samuel Coleridge’s famous poem kept running through my head: In Xanadu did Kubla Khan/A stately pleasure dome decree. This is, by any measure, a profligate vessel. 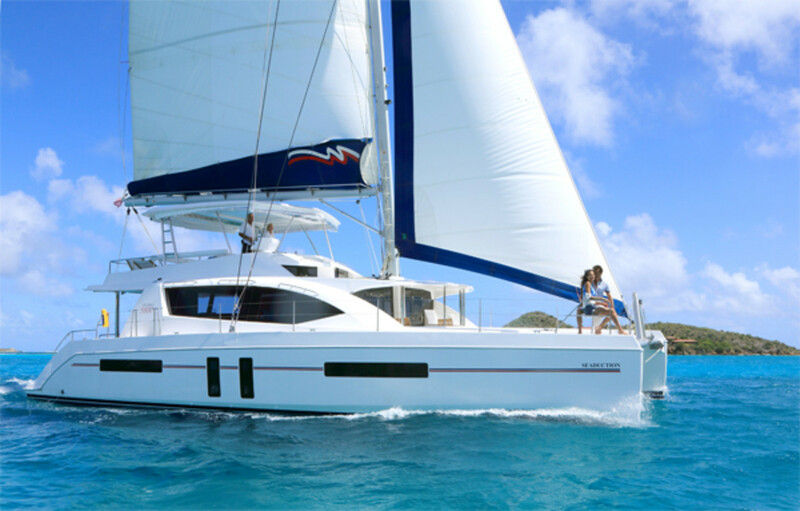 Here the modern trend of maximizing social space and accommodations in built-for-charter production cruising catamarans has been brought to its logical conclusion. Traditionalists are sure to be alarmed as they gaze upon this three-story palace, which seems nearly as tall as it is wide. But many others, particularly those who most value comfort and living space in a boat, will be amazed. There is certainly nothing alarming about the boat’s construction. Designed by Simonis Voogd and built by Robertson and Caine in South Africa, the Moorings 5800 builds on concepts first introduced in the Moorings 4400 (Leopard 44) and, like other boats in the line, is solidly built with balsa-cored fiberglass hulls that are vacuum-bagged to minimize voids and precisely control resin content. 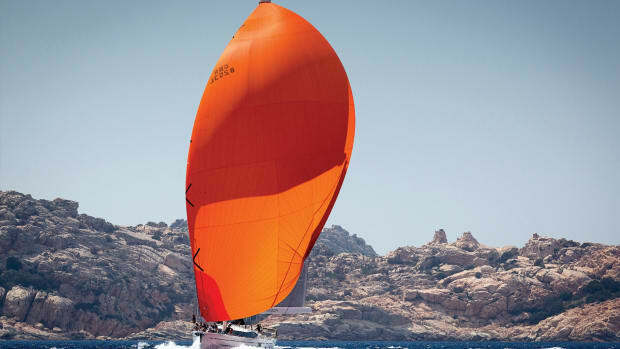 The keels are filled with closed-cell foam to increase buoyancy and limit moisture migration. The spars are good old-fashioned aluminum. It is when you consider the boat’s specifications that eyeballs start popping. The masthead stands 96 feet above the water (no ICW transits in this baby, thank you very much), and the boom is 20 feet high. The bridgedeck takes up about 80 percent of the lateral deck plane area, and the clearance underneath is just 3ft 3in (at half load weight). Empty, the boat weighs a tad over 53,000lb, and with a full payload of nearly 20,000lb total displacement, this climbs to 73,000lb. 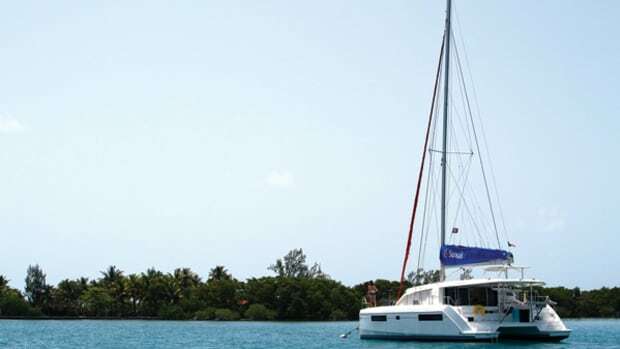 None of this helps the boat when sailing, but it does help this remarkable vessel achieve its primary purpose, which is to keep crew and guests as comfortable as possible. The deck plan features not one, but three different areas where folks can gather and socialize outside. First there is the traditional aft deck/cockpit, directly behind the bridgedeck saloon, which has no built-in furniture (though the deck locker here is plenty big enough to store some loose furniture) and opens on to a unique hydraulically controlled aft swim/tender-storage platform that can be lowered into the water. Next, directly in front of the cabinhouse and mast, there is a forward cockpit—really a lounging area—that looks out over the bows. Finally, there is an enormous flybridge with a targa top that stretches across almost half the overall length of the boat. All three areas are treated with faux-teak Tek-Dek flooring, which is both attractive and durable, and helps to break up what would otherwise be a vast amount of white surface area. The flybridge, for sure, is where people will usually hang out. Here you’ll find seating for 12, a dinette table, a sun deck, a wet bar with fridge and a dedicated barbecue grill. And, yes, you can also sail the boat from here. All control lines, including the single sheet for the self-tending jib, are led to a trio of electric Lewmar winches right by the helm. 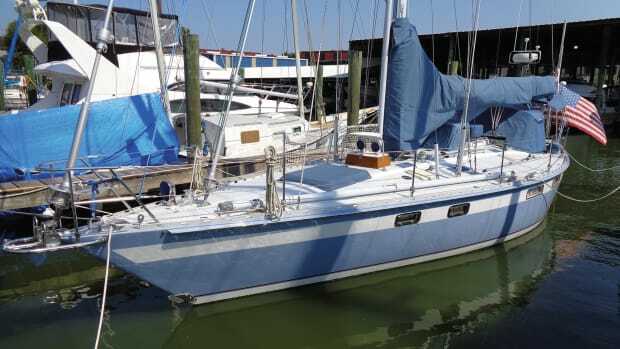 Thanks to the helm’s strategic position—close behind the mast, not too far forward of the double mainsheet bridle behind the sun deck—the line runs are all reasonably short, and the controls are thus easy to manage. The one exception is the headsail furling line, which by my count runs through six right-angle turns on its long voyage from furler to winch. You’ll want to be careful with this line, as it will be hard to distinguish between inherent friction and “malfunction friction” when handling it. 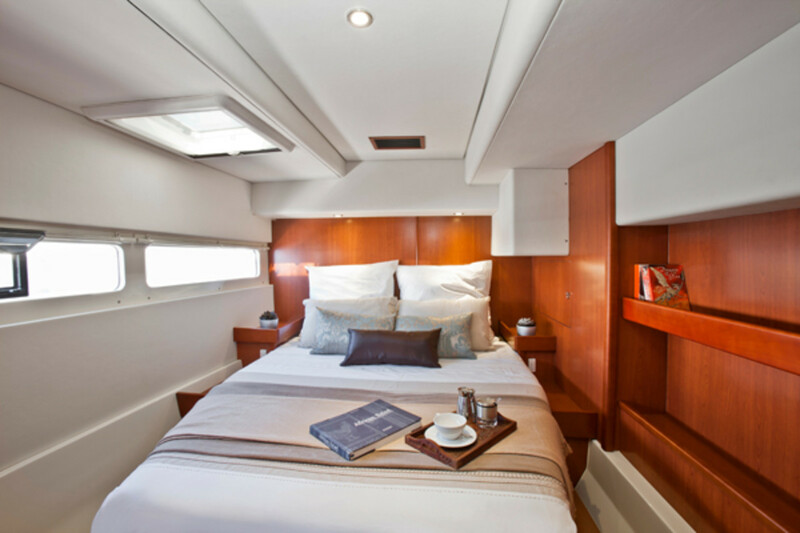 The most stunning aspects of the boat’s interior are the light, airy bridgedeck-level double staterooms just forward of the saloon. Each has an ensuite head and shower and opens directly onto the forward outdoor lounging area behind the bow trampolines. 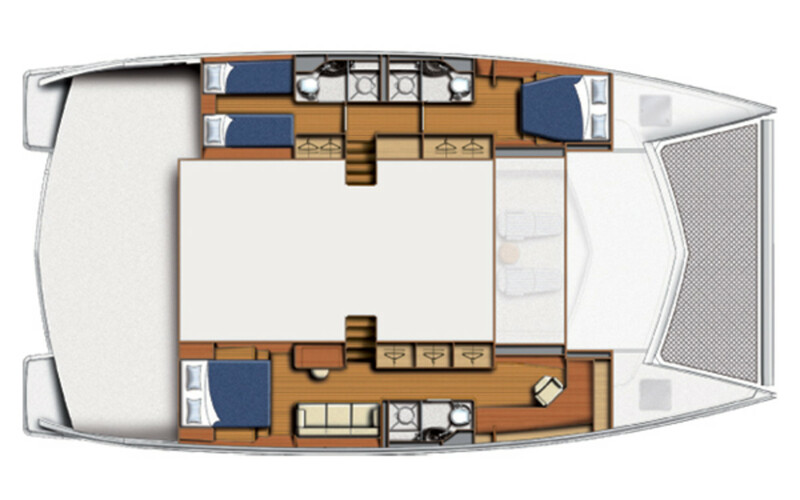 There is also room for four conventional double staterooms down in the hulls (each, again, with an ensuite head and shower). Small crew berths can be fit into the two forepeaks. 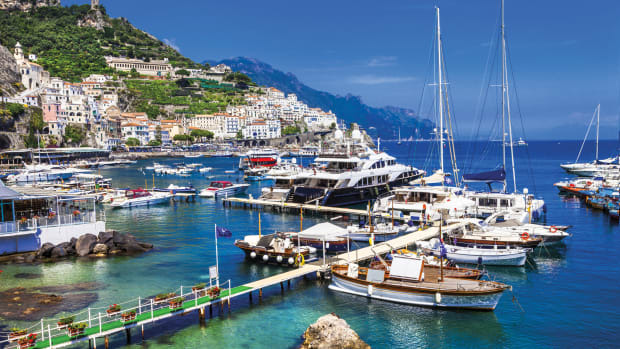 Depending on which version of the boat you buy (Moorings or Leopard), there are numerous optional layouts with between two to six separate staterooms and three to six heads. The most palatial owner’s layout (the one Kubla Khan would go for, I’m sure) has a single full-breadth owner’s stateroom on the bridgedeck behind the front porch. 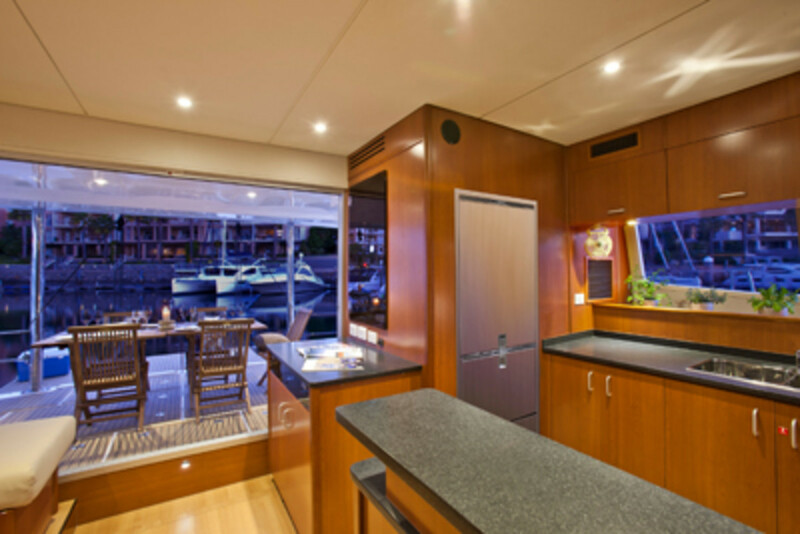 The galley/saloon area is enormous at 750 square feet, and is perfectly laid out. From the galley—which has oodles of counter space, good storage and a full suite of house-sized appliances—it is easy to serve people seated either at the large dinette table directly opposite or on the aft deck. The interior finish overall is quite good for a production boat and features cherry laminate on the bulkheads and a nice Austrian walnut on the cabin sole. Sailing the boat on Chesapeake Bay we had true wind speeds of around 10 knots, but with some gusty patches where the apparent wind suddenly pumped as high as 20 knots. This had little effect on the Moorings 5800. In fact, there is little sensation of speed when you’re up on the flybridge and little tactile connection between the hydraulic helm and the wetted surface of the hulls three stories below. To steer well you need to pick a target on the horizon and keep a close eye on your wind instruments and the rudder-angle indicator. That said, the boat did sail faster than I expected. Our best speed for the afternoon was 9 knots at a 60-degree apparent wind angle in 20 knots of apparent breeze. Close-hauled, sailing in flat water, we managed 7 knots at a 40-degree angle, again in a 20-knot apparent breeze. 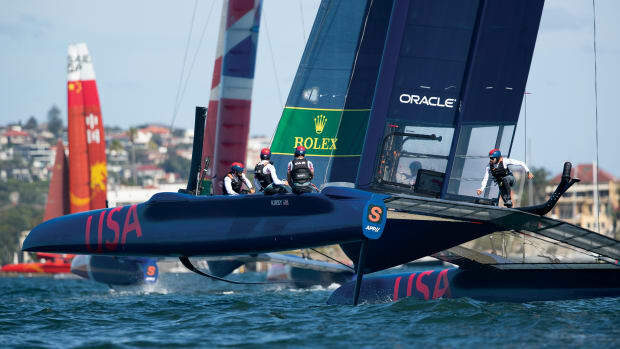 Bearing away onto a broad reach, our speed dropped to under 5.5 knots at a 120-degree angle in over 15 knots of apparent wind. If you buy this boat as a Leopard and plan to sail it as much as possible, you’d be well advised to pony up for the optional sprit and screecher. The standard power plants are a pair of 75hp Yanmar diesels turning three-blade fixed props on saildrives. The props have plenty of bite and make it easy to maneuver. They also move the boat along at a good clip in a straight line—we hit 8.9 knots with both engines spinning at maximum revs (2,800), and with both engines set at cruising speed (2,000 rpm), we were still going just over 7 knots. 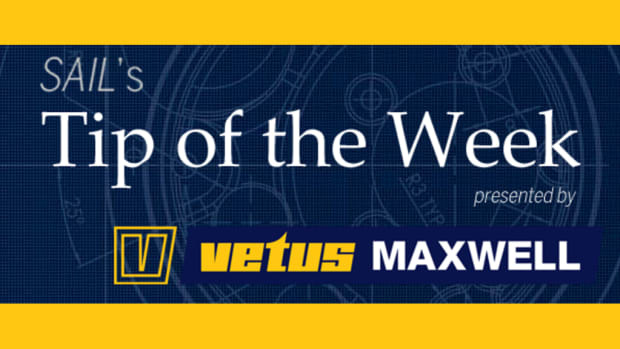 According to the skipper on our test boat, who had delivered it from South Africa, the most efficient setting is to turn just one prop at 2,000 rpm. This yielded a speed of 5.7 knots during our test and reportedly results in a fuel-consumption rate of just over one gallon per hour.  The Moorings 5800 is not the boat for anyone looking for pure sailing performance, but if you want a cruiser that has fantastic accommodations and lots of room for partying and hanging out, you can’t do any better than this.